Simply the cutest appetizer! Everyone loves these! They are healthy and tasty! Only a few ingredients that are easy to put together. Enjoy these at your next party! 1. Skewer one end of a fresh basil leaf and then slide one mozzarella ball and one cherry tomato on the stick. Press the other end of the fresh basil leaf onto the end of the skewer. 2. Combine olive oil and balsamic vinegar. Drizzle over platter of caprese skewers before serving. Easter is coming quickly and soon you will be planning a menu for the holiday. For a fun Easter dessert, try this Easter Bunny cake. You can make the cake from scratch or from a mix depending on your preference. 1.In a large mixing bowl, take your cake mix and add in 3/4 cup water, 2 tsp vanilla, 1/2 cup softened butter, and 3 eggs. 2. Combine well and pour into two 8" round cake pans with parchment. *You only need one 8" cake, but the recipe makes two, so you will have an extra round cake. * Bake on 350 degrees until toothpick comes out clean, for about 20-25 mins. 3.While the cake is baking, make frosting by beating the butter, cream cheese, and vanilla together. Add in sugar and continue beating until light and fluffy. Set aside in refrigerator. 4. Let cake cool and then remove from pans. Take one of the round cakes and cut in the half. Then stand them up vertically, side by side, so it is shaped like a half circle. 5. Using a sharp knife, cut and remove a small "v-shaped" section of cake to form two humps (head/body). Take the piece of removed cake and round it. Place at the back for a tail. 6. Take a portion of coconut and mix with a few drops of green food coloring for the grass. 7. Frost entire cake and gently press white coconut all around cake and sprinkle green colored coconut around the cake, on the base. Press two black jelly beans into the face for eyes and an orange one for a nose. Toss a few jelly beans around the cake in the green coconut grass. I am in love with potato skins. They are just all the good tasting, unhealthy things I love rolled into one, so what's not to love. And I recently discovered that they are not too hard to make either. Give these a try and you'll love 'em! 1. Boil potatoes in hot water for about 15 minutes, then remove and cool. 2. Cut the potatoes in half and use a melon baller or small cookie scoop to make a cavity. 3. Heat oil in a rimmed baking sheet in a 425 degree oven for a few minutes to warm. 4. Place potatoes skin-side up for 20 minutes, then flip over and cook another 10 minutes. 5. If you want traditional potato skins, use cheddar or for some extra spice use pepper jack cheese. Fill cavity with cheddar or jack cheese and bacon crumbles. 6. Bake for another few minutes until the cheese melts and serve warm with sour cream on the side. Even though it feels as if Christmas and Valentine's Day just ended, before we know it St. Paddy's day and Easter will be here! So today, I'm sharing these cupcakes I made for Easter. My hubby is obsessed with peeps, and so is my grandpa, despite the fact he shouldn't have them. These were super simple and cute for a last minute Easter dessert. I used this homemade cake mix recipe and this cream cheese frosting recipe. 1. In a large mixing bowl, take your dry cake mix and add in 3/4 cup water, 2 tsp vanilla, 1/2 cup softened butter, and 3 eggs. 2. Combine well and bake on 350 degrees until toothpick comes out clean (about 12-15 mins). 3. Now for the frosting, start by beating the butter, cream cheese, and vanilla together. Add the sugar and continue beating until light and fluffy. 4. Frost cupcakes with large dollops of icing and smooth out the top. Then roll the edges in sprinkles, leaving the smooth top sprinkle free. Stick a peep of your choosing on the flat top. 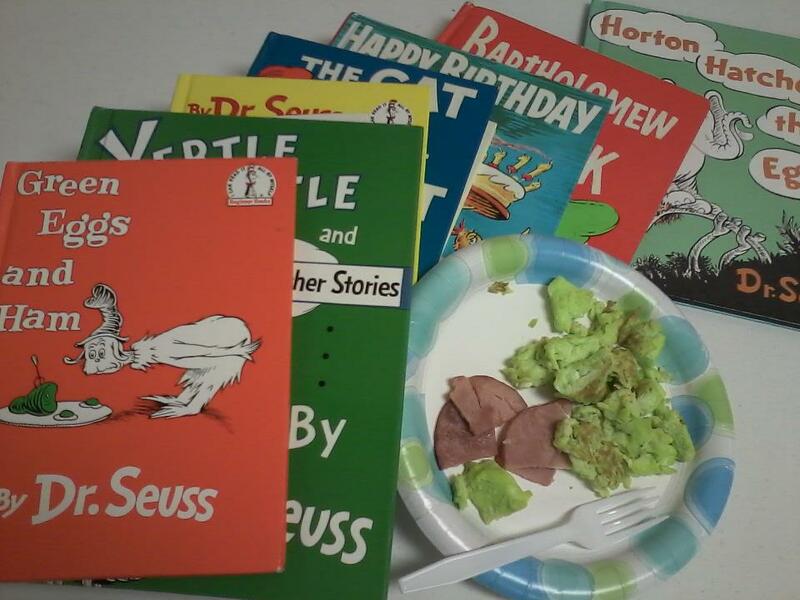 Just a quick shout out to one of my life long obsessions and childhood authors, Dr. Seuss! Happy Birthday! And yes, both my husband and myself donned red and white striped hats, all black clothing, white gloves, bow ties, and eyelinered faces to school today to be the Cat in the Hat. The kids loved it! After reading many good books with all the students and eating green eggs and ham, I'm ready for the weekend! Have a lovely weekend all!